ISIS is a criminal organization which was created, and is used, by the USA. As for Syria, it was not only the intervention of Russia, which in any case came after a number of years of war. It was also the ability of the Assad government to defend itself, in particular by securing the economic viability and nutritional sufficiency of Syria but also by forging an army capable of defending its country. This is emphasized by Leila Khaled, leading cadre of People’s Front for the Liberation of Palestine, in the following interview. The People’s Front (PFLP) is, after Fatah, the second most powerful grouping in the Palestine Liberation Organization (PLO). It has its headquarters in Damascus and is the most important organization of the Palestinian Left, with more combative positions than those of Fatah. We took advantage of Leila Khaled’s recent visit to Athens, where she participated in the festival “Resistance”, organized by the newspaper “Dromos tis Aristeras” (Left Road) to obtain from first hand, the judgements of one of the centres of the Palestinian movement, on the dramatic developments that are now unfolding in all of the Middle East. Because the PFLP was a Marxist organization with an internationalist ideology it was feted by the circles both of the European “anti-imperialist” Left (such as, for example, the International Revolutionary Marxist Tendency [TMRI], an international organization headed by the Greek Michaelis Raptis (Pablo) ) and by the “Third Worldist” groupings such as the Sandinistas of Nicaragua. These forces also contributed practically to the international (outside the Arab world) armed actions of the PFLP. Conversely, their cadres were trained in Palestinian refugee camps. They included Greek opponents of the military dictatorship and Cypriot socialists, who wished to prepare for similar forms of action for the liberation of their island from Turkish occupation. 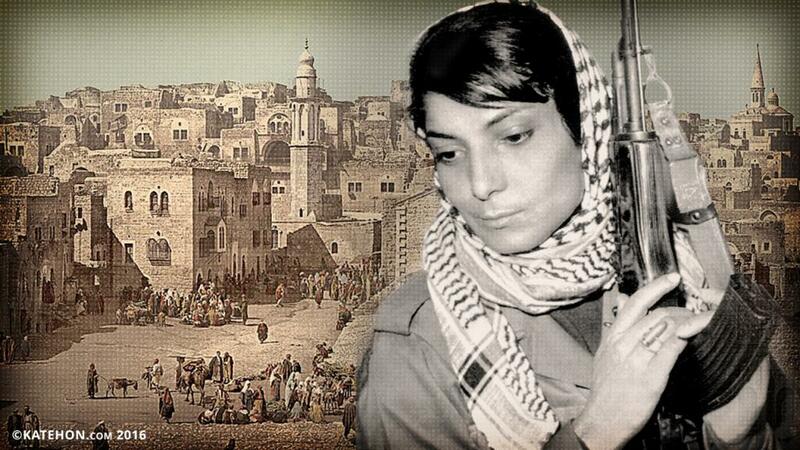 For Leila Khaled developments in the Middle East are the outcome of implementation of a plan aimed at destroying the strongest armies of the Arabs (the Iraqi, the Libyan and the Syrian) but also their countries, the site of great ancient civilizations. As for the differences between neo-conservatives and the tendency of Brzezinski or Obama with Netanyahu, she believes them to be tactical, with no bearing on major strategic objectives. Khaled believes that the plan for federalization of Syria is part of a scheme for “fragmentation” of the states of the Middle East. She says that the Kurds “are being used” and she maintains that Israel is evolving towards a variety of fascism. D.K. Summarizing many decades of Palestinian struggle, it would be easy to conclude that the Palestinian movement has been defeated. It waged a heroic struggle, but it did not achieve its aims. What would you say in response to such a remark? L.K. I don’t see it that way. The struggles of the peoples are not measured in terms of a handful of years. They are cumulative and this aggregation leads, as Marxists say, to qualitative change. The Arab movement needs more than one generation. We succeeded in assimilating a culture of resistance, the conviction that we cannot continue living as we live now, under occupation, that we cannot permit the continuation of this occupation. It is for this reason that we are obliged to continue, with all the trials and tribulations, all the pain, all the sacrifices. And despite all this we remain devoted to the dreams of our people, to the goal of restoration and return to our homeland, liberated from the Zionists. D.K. In the course of the past decades we have seen, within the Palestinian movement, but also more generally in the Arab world, a turn from the predominance of nationalism to the predominance of Islamism. Probably this was something preferred by Israel, so as to secure the support of the West, something that was harder to achieve for as long as it was confronted by national liberation movements and secular regimes. How do you interpret this turn? the army made their revolution in Egypt, they suppressed the Brotherhood because they regarded them as an internal threat. But this changed with the war of 1967, when all of Palestine, the Golan Heights and Sinai was occupied by Israel and in 1973 Israel’s agreement with Egypt was signed, removing it from the conflict. Egypt is the dominant power in the Arab world. As for the reactionary Arab regimes, they said they were with the Palestinians, but they stabbed us in the back, despite financing the Palestinian resistance and the PLO. When the Palestinian armed resistance made its appearance after 1967 it was hit by Jordan, in Lebanon and by Israel of course. The Palestinian revolution was hit by the Israelis and in 1982 it was forced to leave Lebanon. And before that it had taken a beating from Jordan, under the direction of Henry Kissinger and the US administration, who planned and directed the whole process, following a strategy of splitting the Arabs and the Palestinians, the better to deal with them. Kissinger’s first move was at Camp David (1973), to detach Egypt from the conflict. There was popular resistance to the agreement in Egypt, because the Egyptian people supported the Palestinians and the Egyptians, who had gone to war three times against Israel, perceived it as an enemy. This gave the Islamists the opportunity to resurface, giving expression to this opposition. D.K. By the way some people believe that even today Israel has quite an influence with the Egyptian army. L.K. That’s true to some extent, but it is not so effective today. To return to the Islamists, Hamas, which is the Palestinian branch of the Muslim Brotherhood, was founded in 1988, to participate in the Palestinian popular insurrection, the Intifada. They were supported by various countries and the international Muslim Brotherhood. But they didn’t join the united Palestinian national resistance. They preferred to remain on their own. And of course the Iranian revolution against the Shah played its part. Look now at what happened. In 1982 we sustained a defeat. The PLO leadership was out of the country. In 1990 the Soviet Union and the socialist countries collapsed. We lost the support that we had had. The Arab national cause was defeated. So it was very easy for the Islamist groups to rise up again. D.K. So what is involved reflects the defeat of the Arab national cause. L.K. Exactly. Seeing in our societies that everything was collapsing around them, they went back to Islam. And they believed in the Islamists also because Hamas and El Jihad were in fact putting up a resistance, apart from the split they were provoking. D.K. Many people say that the Arabs themselves are at fault for what is happening to them. They never unite, etc. etc. L.K. That is true. It is not just our enemies. It is we ourselves. How we act against our enemies and against our peoples. At the official level, the Arab regimes are not democratic. They don’t do what they should do for their people. They don’t have democracy, sustainable development. Their economies are linked to the imperialist centre. .
D.K. The Soviet Union played a role in the creation of the state of Israel, but later they helped the Arabs. What was the effect of all this on the Arab Left? L.K. The Soviets developed a good relationship with Egypt in Nasser’s time, with Syria and with Iraq. They supported South Yemen in its struggle with the British. But unfortunately all this collapsed with perestroika, glasnost, Gorbachev and Yeltsin. This represented a great loss, at first, for theor people themselves. D.K. How do you see the role of Russia in the Middle East today? L.K. First and foremost they want to defend their allies. They want a foothold in the region, in accordance with their interests. Now they don’t base themselves on principles. They base themselves on vested interests. And it is in their interest to defend their own country in the Middle East. In reality they are defending themselves. This is why they intervened to defend the Assad regime from ISIS and from foreign interventions. Because the Americans are in Iraq but also in Syria, surreptitiously, employing other means. D.K. Do you judge the Russian intervention as positive or negative? L.K. To some extent it has thwarted attempts to bring down the regime. D.K. Recently we have seen very serious and quite unaccustomed differentiations within the Israeli establishment, such as the declarations of the former Defense Minister and senior officers of Mossad, against Netanyahu, using very harsh language. How do you interpret this? and that we are seeing in society and in the army features comparable to what was seen in the thirties in Germany. And he was denounced very vigorously by the government. But he was telling the truth. Because more and more parties are appearing that, even in their own name, regard Israel as a Jewish state. But when you say a Jewish state you are saying apartheid, because 20% of the population of Israel are Palestinians. D.K. Such a historic turn, if in fact confirmed, would be very impressive. Given the great role played, at least by poor Jews, by their workers and intellectuals, a century ago, in the international socialist movement. But also the history of their persecution, particularly by the European far right. It seems as this people goes through a monumental “paradigm change”. L.K. Look, they have placed the Holocaust as the founding stone for their demand to have a country of their own in Palestine and now they are carrying out the Holocaust of the Palestinians. But the Palestinians had no involvement in what happened in Europe with the two world wars. We were under a mandate. We were under a colonial regime also. D.K. In human psychology it is said that human beings behave as they are behaved to. I wonder if the same applies with nations. One day, going to Ramallah with George Papandreou where we were to meet Arafat, I saw written on a brick, next to the checkpoint, the word “Achtung” (“attention” in German). Not even one German a year goes through there. I thought I was entering symbolicall the Warsaw ghetto. L.K. Fascists are in action there, against the Palestinians. .
D.K. Speaking of fascism, I have been impressed by the approach of many organizations of the European far right to circles in Israel. Given the history of it and their ideology up to now, it was the last thing anyone would expect. L.K. It took us twenty years to educate our people that Judaism as a religion is one thing and Zionism another. When we were kids and our mother wanted to punish us or frighten us she would say: “I will tell the Jews.” Always the Jews were our enemy. But we changed that. Our people does not equate the Jews with the Zionists. They understand that a Jew is a human being. But of course with the Jews and Israel strange things happen. For example American presidential candidates usually highlight on their programs the security of Israel, not the security of the USA! D.K. What do you think of Trump? D.K. You present Obama as a simple changing of the guard. But he disagreed with Netanyahu and stopped the plan for war with Iran. That is not insignificant. to Israel. After that came Syria, in the context of the American plan for the new greater Middle East, with Israel as the strongest power in the region. D.K. Still, there were potent differentiations inside the American establishment. What you describe was primarily the plan of the neocons. L.K. These are tactical differences, not major disagreements. The American-Zionist plan was for destruction of the three biggest Arab armies: the Iraqi, the Syrian and the Egyptian. All three of these countries are also countries of great civilizational significance. Look what they did in Baghdad when they occupied it: the looting and the destruction of the museum. Now they’re doing the same thing again, but using ISIS. D.K. You think that the Americans founded ISIS? L.K. Yes. They founded it in Iraq and they are using it. Even though they say that they are fighting terrorism. There have been many appeals for a conference to define terrorism. But they have never done this. Because they want to use the term “terrorism” as it suits them. D.K. You are a terrorist for them, though I admit you don’t look very much like one. L.K. I’m not interested in what they say. I know who I am and I know my people and that’s enough as far as I’m concerned. D.K. On a Russian site, Sputnik, I recently read an article saying that Russia could replace the USA as Israel’s strategic ally. Could something like that happen? L.K. No, it’s not possible. Their interests are different. D.K. Look now, they’ve destroyed Iraq and Libya and in part Syria also. Those three states were based on a specific balance between the national components in them, which in part reflected the colonialist strategy. Do you think that it is possible for there to be a return to the previous status quo, e.g. in Syria. Or a federation, for example? L.K. The aim was for them to destroy Syria. D.K. The Russian intervention prevented that. the Popular Front for the Liberation of Palestine, made our position clear from the outset. We are not part of this crisis. We are refugees in Syria. The people of Syria has the right to make decisions for its country. We support the popular demands for democracy and freedom. It is the people of Syria who have the right to change its regime. It isn’t our task. We have our hands full with Israel. Neither the opposition nor the regime were happy with that stance and they openly disapproved of it. But we didn’t leave Syria. We are going to stay here because we have nowhere else to go. And they give us due respect as Palestinians in Syria. 600,000 Palestinians live in Syria, though many have left because of the crisis. D.K. How do you see the role of the Kurds today? L.K. They are using them now. Barzani is with the Israelis and the same applies for the Kurds of Iraq. Israeli companies are now operating in Iraqi Kurdistan. D.K. What about the Kurds in Turkey and Syria? L.K. They have the right to autonomy in Turkey and in Syria. .
D.K. Autonomy or a state? L.K. Look, the Kurds live in four countries: Turkey, Syria, Iraq and Iran. If they want to secede I don’t think it will work. These countries are not allies. But when it comes to the Kurdish issue, all four of them ally with each other! D.K. The plan for a federation in Syria? L.K. I disagree with it. This plan is part of a project for fragmenting Syria into small states.